Stay stylish at the game by wearing your favorite silhouettes in team friendly prints. I love pairing this All Sport Couture top with simple leggings and my Chciago Bears Wellies by Cuce Shoes for on trend game day style. Week 5 was another troubling sign that when our defense isn't scoring points (or creating turnovers) we're a lackluster team on both sides of the field. Coming off a hard loss in Detroit the Bears had to face another tough competitor the New Orlean Saints. With their daunting offense and newly improved defense it wouldn't be an easy task to take down the Saints. The defense played well early on but with the offense coming on and off the field quick with a few three and outs our weaknesses were highlighted and a tiring d-team could no longer deny Drew Brees and the Saints from the end-zone. Our ball control was much better this game, but since we weren't able to cause any turnovers our dynamic defense became dull and our problem areas were magnified. While we lost the game we're still at the top of the NFC North and with a game against the New York Giants at home it should be a W for the Bears tonight. But with an 0-5 team they'll be desperate and determined so we'll still have to play hard and without mistakes tonight in order come back with a convincing Thursaday night win. 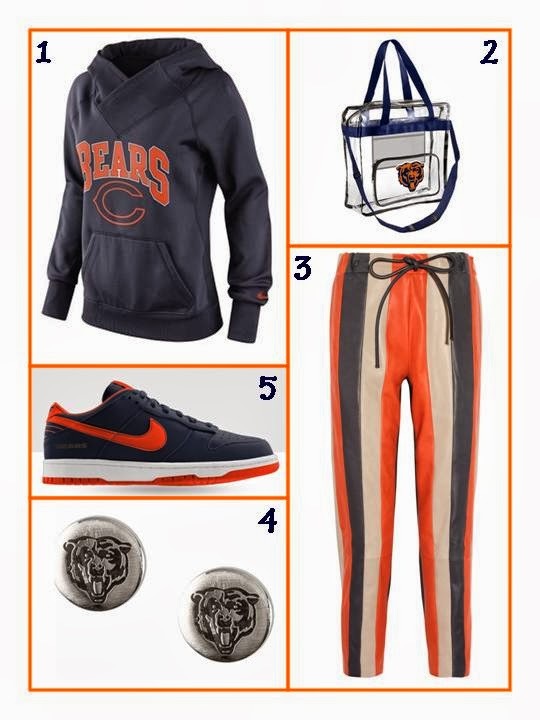 And since we're playing at Soldier Field it's the perfect time to show off some game day style tips. I love pairing something luxe like these striped leather pants with game ready faves. This logo printed hoodie has a slim fit and signature neckline so it's a bit more stylish than the usually oversized sweater. And to finish out this outfit pair some Nike lo tops and a NFL approved clear messenger bag so you'll be ready for game night with a fashion forward twist. Use the hashtag #BearDownBabes and show me your Bears Fashion for Week 6!